Th-INK-ing of You: May Birthday Blessings Fill You with Joy! Hello friends! 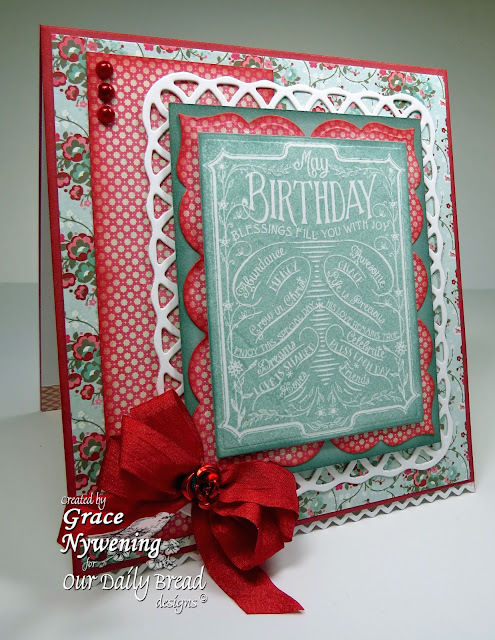 I have another card to share with you today using this month's Our Daily Bread designs release. This set is Chalkboard - Birthday and Thanks. I wanted to show that because these stamps have a solid background, you can easily stamp them with any color or technique that you like! Chalkboards are definitely trending right now... but for those times you are sending to someone who you know would prefer softer colors, this stamp is still the perfect solution! I stamped my white card stock with Sage Shadow Ink, which was a perfect match for this pretty designer paper from BasicGrey called True Love. I used ruby red and sage shadow card stock, and also white for the SB Lattice frame. I cut my mat with SB Lable 23 and sponged each layer. Most layers are popped up with dimensionals. At the bottom is an Martha Stewart edge punch (Lattice but I only used part of it that looks like ric rak) The ribbon is May Arts. A little bling and metal rose are my only embellishments. I decorated the inside with coordinating paper. Hope you like it! Cards by Lady Anne / Monday Anything Goes Challenge - Anything Goes, Crafty Bloggers Network - Anything Goes, Forever Friends - Use Ribbon or Lace, Love to Create - celebrate, Make it Monday - always Anything Goes, Paper Playtime - Border Punches' MyGrafico - Anything Goes, The Crazy Challenge - Birthday, Word Art Wednesday- use their freebie sentiment, or any encouraging or faith based sentiment. Gorgeous card. Love that stamp. As always your cards make me drool. They are so beautifully put together , everything matches and your bows are always perfect. My jaw drops as I gaze with delight at your entry. Hi Grace: Before I forget, I want to congratulate you on your win with that STUNNING chalkboard card you made last week. It really was an amazing card, and you deserved that win. I do want to ask you about the black floral paper you used on that card, and the sweet floral paper you've used on this card. Would you mind telling me the brand/line for both of those? If it's not too much trouble to shoot me an email. Your cards always amaze me, and I am SO very grateful to have you share your God-given talents in our challenges. I appreciate it, and you, SO very much. I hope that the Lord is blessing you with a wonderful week. God is just SO GOOD to give us such pretty things for our eyes to see (like your beautiful art). THanks for sharing! What a beautiful card! Love the papers you used. Visiting from MIM :) Hope you have a great day! Beautiful Grace - the more I see these chalkboard stamps the more I am tempted... and you have showcased them beautifully. Нellο There. I found your blog the uѕe of msn. Thiѕ is a rеallу well written article. return to read more of уour useful information. Thanks for the post. I will ԁefinitely return. Your work is again, so beautiful! I love all the layers, colors and patterns together! very pretty, such lovely papers and such great layering of the dies! This is beautiful Grace, I love the colour combo, it's gorgeous. I love all the layers and that ribbon is luscious! This is gorgeous Grace!! I just love the red with your green chalkboard!! The dp and bow with your dies is perfect...Another stunning card!! Beautiful card, love that image and the gorgeous papers and lush ribbon bow. Thanks for linking up with Make It Monday this week. Beautiful card, that bow is absolutely gorgeous! Stunning card Grace. Love everything about it. What lovely layering! Thank you for sharing your creation with us over at love to create challenges. Gorgeous card! Love how you did the chalkboard technique on the soft color! Thank you for joining our Celebration Challenge this week at Love to Create Challenge Blog. Absolutely Gorgeous!! Thank you so much for joining our 1st Birthday Celebration at Love to Create Challenges!